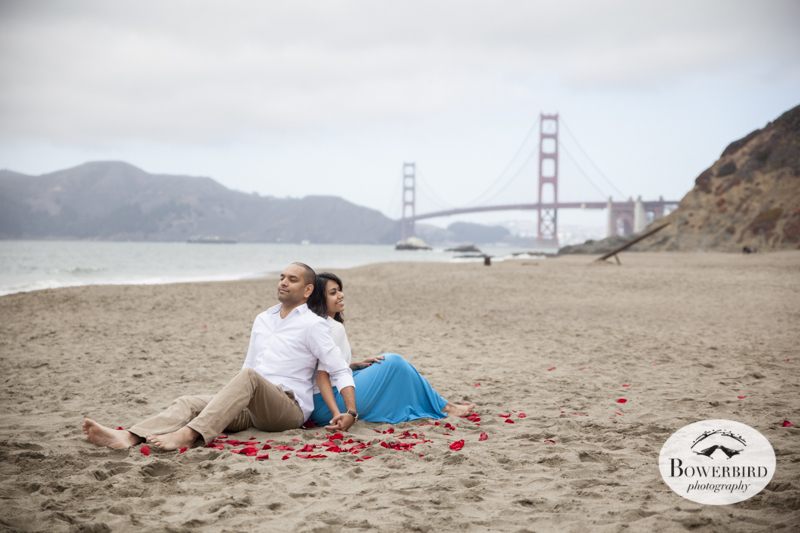 A few weeks ago we went with Hemali + Abhishek to Baker Beach to take their engagement photos, and as we walked down the sand, we encountered a scattering of gorgeous red rose petals. We shortly learned that such magical occurrences are to be expected around these two - and we definitely took it as another sign of their good luck! Hemali + Abhishek are such a lovely couple. Even though this was the first time we had met them, we immediately felt a connection, swapping concert and travel stories. They are both so relaxed together and up for anything. San Francisco Engagement Photo Session on Baker Beach. © Bowerbird Photography 2013.